Let’s face it, there’s something unspoken between us. No baby, it’s not the space between you and me, although sometimes it’s what’s between “u” and “i”. I’ve been trying my darndest, but we’re just not fitting together right these days. Maybe it’s our increased size, but either we’re squishing into each other or we’re just too far apart. Frankly, it’s affecting my attraction to you. There’s only one solution, sweet pea, we’ve got to kern. Our glyphs just need to get closer (but not too close) so that they fit better. And those times when we’re squished (especially when we’re playing as “scripts”), we need some positive kerning – pushing our characters farther apart. I know, I know, you’re hesitant. Generally speaking, one doesn’t want to touch a type designer’s kerning. I mean, we were born this way. But y’know, sometimes I think we may have been born a text face, but with some manual kerning we could make it to a display. And yes, when we get that big, we look really loose. We’ve just got to pull it in a bit tighter. Finally, if you’re not opposed to adding a third, I hear the best way to kern is to look at three letters at a time and make sure they look right. 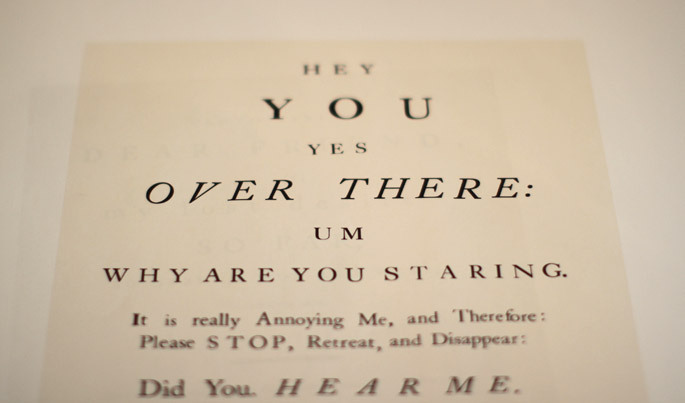 DIY: Try your hand at tracking open and kerning Font Bureau’s William Caslon Text at a display size, such as in this photo. This entry was written by Meghan Arnold, posted on February 13, 2013 at 12:25 PM, filed under Typographic Turn-ons and tagged Kerning. Bookmark the permalink. Follow any comments here with the RSS feed for this post. Trackbacks are closed, but you can post a comment.